Stars from far and wide came together at London’s Dorchester Hotel on Friday November 11 for Surrey based wildlife charity, the David Shepherd Wildlife Foundation's, annual fundraising ball. Guests were treated to entertainment by songstress, Emma Stevens and West country soprano Tamsin Ball while the London African Gospel Choir lifted everyone’s spirits and Dominic Halpin and the Honey Bs swayed everyone into the early hours. Founder and president of the Foundation, David Shepherd CBE who attended with his family was thrilled when the auction, led by TV auctioneer Charlie Ross, raised over £100,000 for two of his paintings including the original sketch of the Foundation’s logo that David had drawn in 1984. 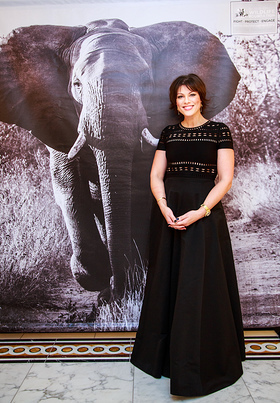 With TV presenter Kate Silverton, actor and dancer Adam Garcia, bestselling novelist Lisa Jewell, Invictus singer Laura Wright and East Enders actor Ricky Groves joining the guests it was a brilliant celebration for endangered wildlife raising over £200,00 for the charities work to protect endangered wildlife across Africa and Asia. “Every year we are so humbled by the wonderful support we receive. That people are so generous and so passionate about their support for endangered wildlife is hugely motivating for the team,” said CEO, Sally Case. The Foundation’s next major event is the 2017 Wildlife Artist of the Year exhibition held at the Mall Galleries from June 27 to July 2. Entry is now open to all artists on the charity’s website at www.davidshepherd.org.